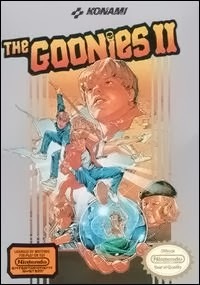 When thinking of Goonies I moved forward and thought of GooniesII the Nintendo game and therefore Nintendo in general. This game was for the NES back in the day. That got me thinking of the ORIGINAL Nintendo and their games. I am NOT talking SNES, N64, Game Cube, or Wii. The Original Nintendo, the one that after time did not play games and we all pounded the cartridges in and out then took them out blew in them and then repeated the process until the game played. I loved the Nintendo. I loved everything about it. There were few games I did not like. I had the Goonies video game and I have to tell you that game was a complete train wreck. There was no opportunity to save your progress. There were so many places to go and things to do. The trouble was, in order to beat the game you had to do everything in an exact order. Imagine spending a whole Saturday inside in the middle of the school year. YUCK. You see, my mom loved Nintendo and did not appreciate us leaving a game on pause so we would not lose progress. It was a sad state to say the least. She thought it was her house so she would play whenever she wanted no matter if there was a paused game or not. Mom would play whatever game we put in front of her but our favorite is the original Legend of Zeda. I love that game. She loves that game. We have both played it until our fingers ached. I still play it from time to time. I can make it through the first quest without dying. The second quest takes 3 lives but none the less I love it. Mom bought a map so that she could mark down everything she found. It was rather cute, really. To this day we play games together as a family and she squeals when she dies. When she can not pass a level she calls me or my brother to help her. After awhile the second Zelda The Adventures of Link came out and this game was quite a challenge. I finally gave up after a time. I love the game but the final level and the approach to it was quite daunting. I think of the hours I spent playing and relief for the rainy days the Nintendo brought. Joy, simple joy in a girls heart. The memories of playing Nintendo in the basement still make me smile.